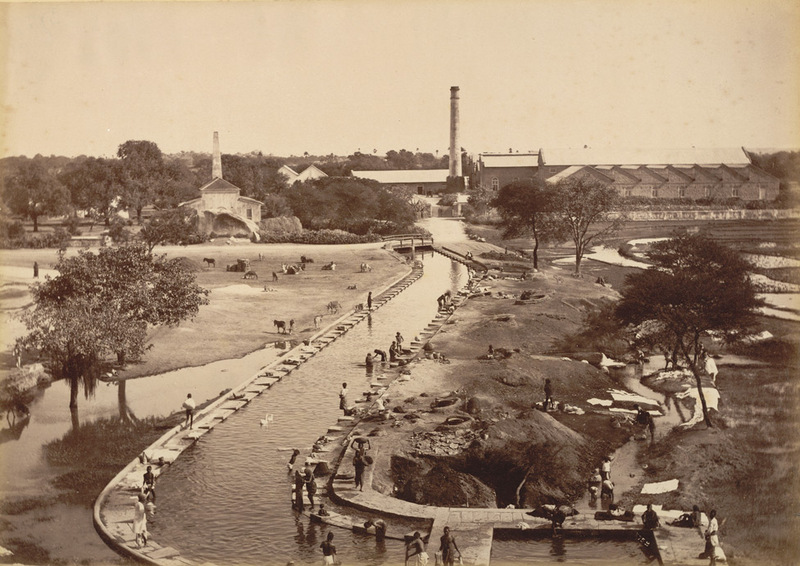 Photograph of mills at Hyderabad, Andhra Pradesh, Curzon Collection: 'Views of HH the Nizam's Dominions, Hyderabad, Deccan, 1892', taken by Deen Dayal in the 1880s. Hyderabad was founded beside the River Musi in 1591 by Muhammad Quli Qutb Shah (r.1580-1612) as an alternative to his capital at Golconda. Later, Hyderabad became the capital of the Nizams of Hyderabad, who ruled over one of the largest states in India. The dynasty was founded by Nizam al-Mulk, entitled Asaf Jah (d. 1748) who arrived in the Deccan as the Mughal governor. In 1724 Asaf Jah declared independence and established the dynasty of Nizams who ruled until 1948. There were no modern industries in Hyderabad before 1874 but a few years later railway workshops were established nearby and four factories sprang up south and east of the Hussain Sagar lake. These industrial units became the centre of new settlements. This is a view of the mills and the nearby canal.